A cheetah cub and its mom are an inseparable pair for the first six weeks of the vulnerable baby cheetah’s life, when the cub is completely dependent on its mother for food, protection, warmth, and shelter. The mother is so important to teaching and protecting the cub, the baby will stay with her until it is two years old, when mom leaves to mate again. Toki and Sambu were just four weeks old when their mother was killed by a lion. The pair was still entirely dependant on her. They hadn’t yet started to follow her around during her kills as they would have at six weeks, or to eat meat as they would at the age of one — never mind starting to hunt independently at eighteen months. Cheetah cubs observe their mother closely for their first two years, learning from her all of the tricks of survival. With no natural skills carried over from their mom, the orphaned cubs’ chances in this world looked bleak. Simon King was determined to raise the odds for the babies, but he knew the task would not be easy given the threats to cheetah cubs. These odds were not improved by the fact that Simon was a human, not a cheetah. “I could not in the least be confident of my role as a surrogate parent. I had read a great deal from a variety of sources explaining the pitfalls of raising orphaned cheetahs, and how very unlikely it was that they would be able to lead a life in the wild. I did feel, however, that it was worth a shot, for their sakes. Having spent over 20 years watching and filming wild cheetahs, I had a reasonable background knowledge of their needs and behavior. But applying this to raising Toki and Sambu was uncharted territory for me,” says Simon. 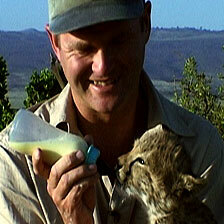 Simon King feeding Toki The filmmaker had to prepare the cubs for a lifetime of survival. His experience with cheetahs taught him that he would have to start right off their education with good hunting skills. Once the cubs learned the basics of the hunt, they could fare pretty well for themselves. In fact, the brothers would likely stay together for the rest of their lives, as male cheetahs often do, forming a coalition against rival male cheetahs. Simon’s four-week-old cubs had probably never left their lair or sampled solid food. Eight weeks is when mom typically introduces solid food to them — their first lesson on what they should eat. Simon’s first task would be to teach the cubs not only what to eat, but also how to make a kill. 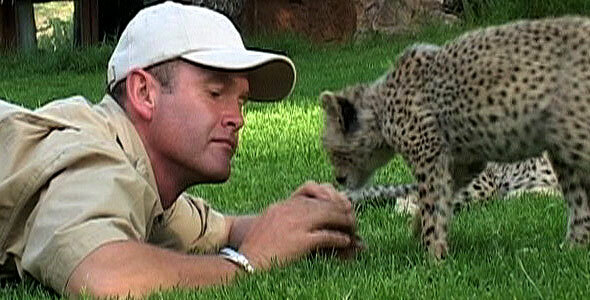 “Hunting comes to cheetahs like walking comes to humans,” says Simon. “They do it naturally, but some do it sooner and more efficiently than others.” At eight months old, when the cubs have lost the last of their milk teeth, they begin to make their first clumsy attempts at stalking and catching. A cub’s first attempts at a kill resemble play behavior more than a vicious attack. Cubs stalk, chase, and wrestle each other and even chase prey that they know they cannot catch because it is too fast or too large. “Few cheetahs will make a solo kill before they are 14 months old, and many much later. There are many subtleties of stalking and prey choice that must be acquired through trial and error. This is the same for wild or hand-reared cheetahs,” says Simon. A mother cheetah tries to teach her cubs how to improve their hunting skills by bringing back her catch live for the cubs. She usually begins with something easy like a newborn antelope and lets the cubs practice chasing and capturing until they are doing it like it’s second nature. Simon introduced the cubs to hunting using a dummy rabbit dragged about on a string. But Simon, of course, was not a mother cheetah and was not going to outrace and bring down newborn antelopes. So Toki and Sambu had to learn how to feed themselves the hard way — by testing their skills each day in the field alone. Gradually making it past these educational milestones and exhibiting a great deal of patience, Simon was able to teach the cubs the essentials cheetahs need to live a life in the wild. A fierce education and a huge accomplishment for both the cheetahs and their surrogate “mom” — Simon.